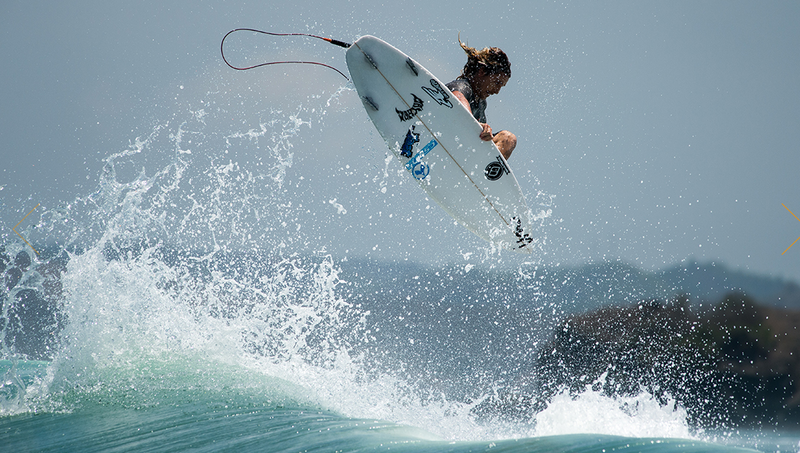 Tracks sent a couple Aussie rippers to Lombok to test out some new models in good waves for the 2014 Tracks Magazine board test. Billy Kean was the lucky one to ride the Sub Buggy. Check out the video to see what Billy had to say about the Sub Buggy. He rode the model as a 5’10 x 19 1/4 x 2 1/4 with 27.4 CL of volume. “When I pick up this board it’s how I always imagined a Mayhem would be, all about high performance. The foil feels perfect. There’s a decent amount of foam under the front foot, but then it tapers off into a nice thin nose and evenly down to the tail. The transition is perfect. The sharp rails in the tail should make it really responsive and the softer rail up through the middle and front thirds should be more forgiving, it shouldn’t catch much during full-rail turns. “When I first jumped on and paddled, it felt right, and once I was up and going it generated a lot of speed in sections when I didn’t expect it to. Sometimes when I initially took off it was nice and smooth, then when I wanted to get going down the line it would just kick and take off. I was surprised with some of the extra speed it generated in flat sections. A couple of times I didn’t even mean to get as much speed as I did. Range? This board would be really good from one to five-foot. I think the Sub Buggy model is designed for that stuff, and the steeper the wave, the better. This board is perfect for critical, explosive manouvers. A Matt Biolis designed board is typically designed for high performance surfing.You look at the people that ride his boards and you can tell. I’d never tried a Mayhem before so I was stoked when I got the call. It had a real professional feel about it, from the rail shape, to the outline, the glassing … you could feel it all under the arm I reckon. I’d love to ride this board at home in beachies, those sessions when you’re going for something wave after wave. I think this board would be epic for practicing new manoeuvres as well. It’s a board I feel like I can improve my aerial surfing on.